Featuring a polite yet firm guitar solo from Eddie Van Halen. This could be the national anthem. There are plenty of songs about football, but not many about rowing. It's about time that changed. 'Best Song Ever'? You'd expect those 1D lads to be a little more modest - aren't they supposed to be British? "Because, if not, then frankly I don't think this is going to work out." This one assumes that you're driving towards Wales. Otherwise, Gloucester would be on the left. If you didn't laugh, it's because you're pronouncing 'scone' wrong. Follow @GadgetInspector on Twitter for more fun...or just grab yourself a Union Jack Mug and make yourself a cup of tea! The Six Nations Championship is upon us again, and people throughout the UK are once more rediscovering their fondness for rugby (if only so that they can be smug when their country wins). Of course, you're not one of those fair-weather fans; you're a true supporter. You care about rugby every second you're awake, and you've no time for these clowns who only watch five games a year. And since you're such a big rugby nut, you'll no doubt be attending a match or two before the end of March. If this is the case, you'll need something to wear...and that, dear reader, is where we come in. 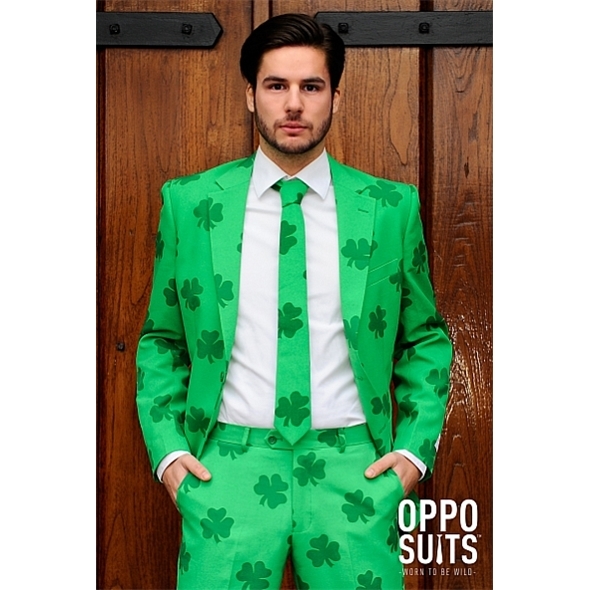 We don't doubt that you were already planning to hit the stadium in your team's colours, but why wear a boring old rugby jersey like everybody else when you could be wearing an awesome OppoSuit? ...and this ravishing Red Suit is so wonderfully Welsh that Max Boyce himself would turn green with envy! We don't have any England-themed suits, but if you can overlook the irony of wearing Union flags while you jeer at members of the other home nations, this snazzy blue-and-red number will do just as well! We were going to suggest that this suit would be good for fans of the French rugby team, but then we realised how terribly trite it would be to suggest that moustaches are somehow inherently French. America is one of the six nations, right? Despicable Me fans across the world are no doubt dribbling at the prospect of Minions, an upcoming feature-length film that will see Gru's adorable yellow henchmen set out on an adventure of their very own. When's the release date? The film comes out on July 10 in the USA, although we lucky Brits get it a little bit earlier; June 26 is the film's UK release date. What's the story? Minions is a prequel to the Despicable Me films. It will show us the history of the minions, giving us a glimpse of what happened to them before they joined Gru's cause. If you've seen the trailer, you already know some details; the minions have been around since prehistoric times, and the sole purpose of their existence is to serve the world's most despicable supervillains. After disastrous stints with Genghis Khan, Napoleon, and other historical baddies, they find themselves without a master, and so three brave minions - Kevin, Stuart and Bob - set out to find somebody new to serve. Who's in it? Well, the minions themselves will all be voiced by Pierre Coffin, who is also the film's co-director. There are big stars elsewhere, though; Sandra Bullock will play Scarlet Overkill, the villainess whom the minions end up trying to woo, while Scarlet's husband Herb will be voiced by Jon Hamm (a.k.a. Don Draper from Mad Men). Michael Keaton, Alison Janney, and Steve Coogan will also star in as-yet-unconfirmed roles. Will any other established Despicable Me characters make a surprise cameo? Not that we're aware of. There's been no suggestion that Steve Carrell (Gru) will be involved in this movie; nor is there any sign of Russell Brand (Dr Nefario) Miranda Cosgrove (Margo), Dana Gaier (Edith), or Elsie Kate Fisher (Agnes) on the cast list as it stands. Will there be another proper Despicable Me film? Indeed there will - Despicable Me 3 is tentatively slated for release in 2017, so Gru and his girls will be back in a couple of years. Can I have my own minion? Yes you can! Our Talking RC Minions are huggable, snuggable, and every bit as adorable as their on-screen counterparts. Get yours here. We've told you about Twist Pong before, but this time, we can actually show you what a round of Twist Pong looks like! Watch the video above to see Paul and Matt from WheresMyChallenge going head-to-head and letting the Twist Pong spinner decides their fate! Who will win? Twist Pong is a unique twist on the classic beer pong rules. Click here to buy a set of your own.